On this day, 56 years ago, a very dear friend, Cheryl, was born to Hazel and Denver 'Mac' McGill (1921 ~ 2002). Cheryl and I grew up together . . . we met in Monterey, California in 1957, living next door to each other. Cheryl's mom, Hazel, babysat me while my mom was at work. I spent many a summers (Bakersfield, Merced, Castro Valley, CA) and even part of a school year (Merced, CA) living in their home. Hazel and Mac treated me as one of their own and I will never forget how loved I was. Both of our families moved and migrated to the Bay Area, living within an hour of each other through-out the years. As Cheryl and I grew older, we stayed in touch as much as life would allow us to. There was a period of time that Cheryl and I lost touch but we connected again when we both had our daughters . . . they are very close in age. The last time I saw Cheryl was in 1981 and just before I moved from Northern California to Southern California, . . . when I moved, we lost touch . . . for over 30 years! This year, I was determined to find her . . . I was very sad to learn that Cheryl passed in 2009 and Mac, her father, passed in 2002, but Hazel, Cheryl's mom, is still with us and well . . . 91 years well! We have been talking . . . a lot, she has been sending photos to me of Cheryl and I. We laugh and cry over so many wonderful memories of those days. What a gift to have found Hazel . . . her mind is bright and sharp . . . she remembers mom and so there are stories that I would have missed had I not found her, she is a beautiful soul and I am so so glad I dug and searched until I found her . . . a sweet reunion! Cheryl is survived by her beautiful daughter, Chelsey and her beautiful mom, Hazel. 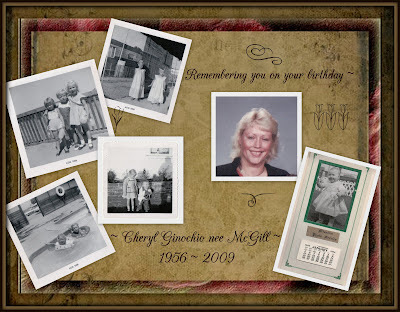 Happy Birthday, Cheryl, we love and miss you . . . .
What a beautiful story Gini! I'm sure Cheryl knows you're thinking of her today! So glad you and Hazel have connected and keep in touch! Life does have its twists and turns doesn't it? But we can always find something good! Lovely tribute, so happy that you found her mother and the bonus stories, priceless! Thank you, Cindy . . . it is truly a bitter sweet reunion and with those twists and turns in life! I am so glad that I found Hazel and at 91 years old and that we are able to share so many memories. Thank you for stopping by and sharing in celebrating Cheryl. Thank you, Carol, I was so relieved to find Hazel. I was at it for days and beginning to wonder but I found her! I'm not as rusty as I thought! So sorry your friend has passed, but I know how happy you are communicating with her mother! beautiful tribute! So happy you have contact with her mother, and so sorry she has passed. Beautiful tribute! Cheryl, thank you! I am so glad I found her, as Hazel is getting up in age. She is just as loving, nurturing and sweet as she was when I was a child . . . she has been a blessing to me for a good part of my life and I have wonderful memories of her, Cheryl and Mac. Thank you for sharing this tender post! Thank you, Miriam, glad you stopped by.